This study concerns the application of non-invasive and micro-invasive analyses for the study of a contemporary artwork entitled La Caverna dell’Antimateria (“The Cave of Antimatter”) which was created by Pinot Gallizio in 1958–1959. The work represents one of the most significant examples of industrial painting. It consists of a total of 145 meters of painted canvas, designed in order to cover the entire floor plan of the René Drouin gallery in Paris, where it was displayed for the first time. Gallizio wanted to create an environment in which visitors could find themselves immersed in painting, in what he termed as a “work-environment”. Non-invasive (Fibre Optic Reflectance Spectroscopy) and micro-invasive analyses (Fourier Transform Infrared and micro-Raman Spectroscopies, Pyrolysis-Gas Chromatography and Gas Chromatography/Mass Spectrometry) were performed on three of the canvases which constitute this work of art in order to obtain information regarding the artistic materials used by Gallizio. Pigments and unconventional materials (such as metal wires, sand) are present in the canvases that form the ceiling. The colours are unevenly distributed on the surface, thus revealing large areas of the white preparation below. In the canvas of the wall, instead, the paint is applied more uniformly and gives a dark colour cast. The analytical results led to the identification of many of the materials used by Gallizio. The pictorial palette consists of both inorganic and organic pigments, while polyvinylacetate, pure or mixed with a siccative oil, was identified as a binder thus confirming what was reported by the artist in his notes. The results of this research provide information concerning the artistic technique used by Pinot Gallizio. The analyses were successfully performed both in situ and on micro-samples in order to characterise the pigments of the coloured area, the ground layer and the organic binders. Giuseppe (Pinot) Gallizio (Alba, 1902–1964) was the main exponent of the Italian industrial painting movement. He developed the concept of industrial painting at the end of the 1950s, abandoning the limited format of traditional paintings for the virtually one of unlimited rolls of canvas. His works had neither a predetermined direction nor a unique point of view. One of the main features of this new concept of art was that of cutting and selling paintings by the meter, according to the size required by the buyer in order to inflate the market and make art available to everyone. In 1958, the writers Guy Debord and Michèle Bernstein, who were friends of Gallizio and co-founders of the “International Situationist”, invited Gallizio in person to give an exhibition at the “Galerie René Drouin” in Paris. The project was to cover the entire gallery space (from floor to ceiling) – the white walls which were normally adorned with paintings – with about 150 meters of industrial painting, thus converting the gallery into a synesthetic environment. It was for this project that Gallizio created, in 1958–59, La Caverna dell’Antimateria (“The Cave of Antimatter”; inventory number: 58 DT 38) as a “work-environment” that provided a concrete representation of the theory of the Anti-World and gave a voice to the new concept of matter as advanced by contemporary physics . The work consisted of nine painted canvases that served to cover the ceiling, walls and floor, and six painted curtains to screen the front door and the staircase on the left wall. All the canvases were painted with different colours that were mixed and/or overlaid with each other. As reported in his Diario-Registro (“Diary-Register”), Gallizio used several pictorial techniques: “olio tradizionale” (“traditional oil”), “soffitto […] resine soffiate a polvere, graffite ad umido” (“ceiling […]: powder-blown resins, wet-painted engraved”), “pavimenti – tela di lino preparata con vinavil […] tecnica delle aniline alla nitro” (“floors: linen canvas prepared with vinavil […] nitro aniline technique”), “tecnica a fuoco, le grandi sacche vengono intaccate con ferro rovente e soffiate – si rompono le sacche con effetti grandi” (“Fire technique: the large bags are burned with a red-hot iron tool and then blown up – the bags break with great effects”). According to the testimony of his son, Giorgio Gallizio, in fact, the canvases for the ceiling were made on the roof of the “Experimental Laboratory of Alba” (where Pinot Gallizio created his works). On that occasion, the artist sewed bags containing pigments and firecrackers, and these were blown up in order to randomly sprinkle colours on canvases that had previously been prepared with Vinavil® glue ,. Today the work, which consists of only seven canvases (all five canvases for the walls and two for the ceiling), is currently stored in the warehouses of the “Luigi Pecci Centre for Contemporary Art” (Prato, Italy). Each canvas is rolled up on cylindrical supports. Although the artwork is in a good state of conservation, a diagnostic survey was performed to recognise the materials used by the artist, in order to identify the most appropriate preventive conservation treatments. For this purpose, non-invasive and micro-invasive analyses were carried out. Specifically, thanks to the courtesy of the curators of the museum, it was possible to have access to three canvases (two of the ceiling and one of the wall). These were unrolled and then analysed using a non-invasive in situ technique (Fibre Optic Reflectance Spectroscopy, FORS in the 350–2200 nm range) on 107 spots (2-mm-in-diameter). The canvases were also sampled after FORS measurements and the samples were then analysed in the laboratories by means of Fourier Transform Infrared (FT-IR), FORS (in the 270–800 nm range), and micro-Raman spectroscopies. Pyrolisis-Gas Chromatography/Mass Spectrometry (Py-GC/MS) and Gas Chromatography/Mass Spectrometry (GC/MS) were also performed on three samples. The present study is part of the more extensive 2-years CoPAC (Preventive Conservation of Contemporary Art) research project, which focused on the analysis of contemporary artists’ materials and artistic techniques by studying a set of selected contemporary artworks belonging to Tuscan museums and institutions. 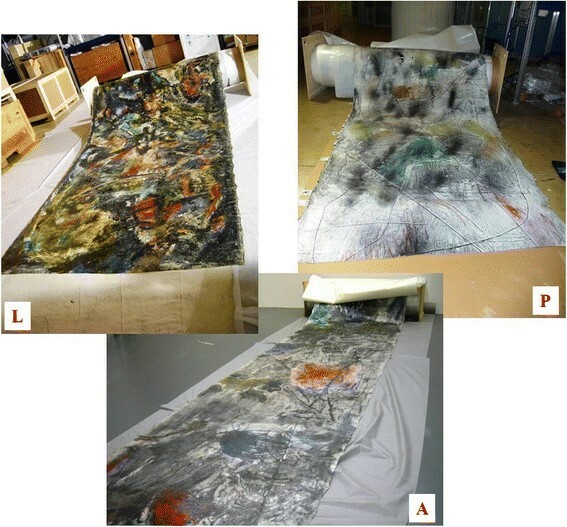 The three unrolled canvases, the objects of the diagnostic survey, are reported in Figure 1. According to the curators of the museum, canvas L constitutes one of the walls of La caverna dell’Antimateria, while canvas P and canvas A are from the ceiling. La Caverna dell’Antimateria : canvas of the wall (L) and canvases of the ceiling (P, A). Eighteen micro samples were collected from canvas L, 13 from canvas P and 20 from canvas A (cited in the text as L1-L18, P1-P13 and A1-A20, respectively). FORS measurements were acquired both in situ on different areas of the three canvases and in laboratory on almost all the samples collected to evaluate eventual differences of the inner surface with respect to the external one and to extend the study to the UV range. FORS spectra in the UV–vis-NIR range (350–2200 nm) were acquired by using two single-beam Zeiss spectroanalysers, model MC601 (190–1015 nm range) and model MC611 NIR 2.2WR (910–2200 nm range), which were housed together in a compact and portable chassis for in situ analyses. The data acquisition step was 0.8 nm/ pixel for the 1024-element silicon photodiode array detector (MCS601), and 6.0 nm/pixel for the 256-element InGaAs diode array detector (MCS611 NIR 2.2 WR). The radiation between 320 nm and 2700 nm, which was provided by a voltage-stabilized 20 W halogen lamp (mod. CLH600), was conveyed to the sample by means of a quartz optical fibre bundle that also transported the reflected radiation to the detectors. The geometry of the probe head was 8°/8°. A Zeiss spectrum analyser, model CLX 500, equipped with a xenon lamp was used to investigate the 270–800 nm (UV–vis) range. Calibration was performed by means of a 99% Spectralon® diffuse reflectance standard. Spectra were processed using Aspect Plus® 1.80 software. Transmittance spectra on the samples dispersed in KBr pellets were collected by means of a Nicolet spectrophotometer, model Nexus 470 E.S.P.™, equipped with a SiC Globar and a DTGS detector. The IR spectra were acquired in the 4000–400 cm−1 range (64 scans were acquired using a 4 cm−1 resolution). ATR spectra were recorded using a Perkin-Elmer System 2000 spectrometer equipped with a Golden Gate accessory. 32 scans were acquired on each sample in the 4000–600 cm−1 spectral range using a 2 cm−1 resolution. The micro-Raman analysis were carried out using a Renishaw Raman Invia instrument. This instrument is equipped with a 1800 grooves/mm diffraction grating, a CCD detector, and a 50X magnifying lens. 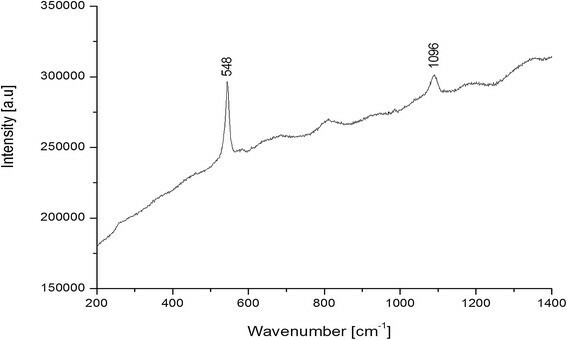 The Raman spectra were acquired using a HeNe laser (λ = 633 nm) as radiation source. Analyses were performed using a pyrolyser (CDS Pyroprobe 5000 series) coupled with a GC/MS system consisting of a 6890 N Gas Chromatography System combined with a 5973 Mass Selective single quadrupole mass spectrometer (Agilent Technologies, Palo Alto, CA, USA). Each sample (~ 0.2 mg) was placed on glass wool inside a quartz tube, and then inserted into the coil of the resistively-heated Pt filament of the pyrolyser. Pyrolysis conditions: initial temperature 50°C, 20°C/ms up to final temperature (600°C for Laropal A81 and Regalrez 1094; 500°C for MS2A), final temperature lasting for 10 seconds. The pyrolyser interface was kept at 130°C, the transfer line at 300°C and the valve oven at 290°C; the split ratio was 1:10. Chromatographic separation of analytes was performed with a fused silica capillary column HP-5MS (J&W Scientific, Agilent Technologies, 5% diphenyl-95% dimethyl-polysiloxane, 30 m × 0.25 mm i.d., 0.25 μm film thickness), preceded by 2 m of deactivated fused silica pre-column that had an internal diameter 0.32 mm. Chromatographic conditions: 40°C for 5 min, 10°C/min up to 300°C, 300°C for 10 min. The helium gas flow was set at the constant flow mode 1.3 mL/min (purity 99.9995%) . For the GC/MS analyses, a portion of sample (0.5 mg) was subjected to saponification assisted by microwaves in 300 μL of KOH in ETOH 10% wt at 80°C for 60 min. The solution was acidified with hydrochloric acid (6 M) and then extracted with diethyl ether (200 μL, three times). The extract was evaporated to dryness under nitrogen stream and then subjected to derivatisation with 20 μL of N,O-bis(trimethylsilyl)trifluoroacetamide (BSTFA), 200 μL of isooctane and 5 μL of tridecanoic acid solution at 60°C for 30 min. 5 μL of hexadecane solution were added just before injection. The GC/MS instrumentation consisted of a Trace GC 2000 chromatographic system equipped with a PTV injection port and coupled to an ITQ 900 ion trap (Thermo Quest, US). Samples were injected in split-less mode at 280°C. GC separation was performed on a fused silica capillary column HP-5MS (J&W Scientific, Agilent Technologies, US, stationary phase 5% diphenyl-95% dimethyl-polysiloxane, 30 m, 0.25 mm i.d., 0.25 μm film thickness). Chromatographic conditions: initial temperature 80°C, 2 min isothermal, 10°C/min up to 200°C, 4 min isothermal, 6°C/min up to 280°C, 40 minutes isothermal. The helium (purity 99.9995%) gas flow was set in constant flow mode at 1.2 mL/min. MS parameters: electron impact ionization (EI, 70 eV) in positive mode; ion source temperature 230°C; scan range 50–700 m/z; interface temperature 280°C. Peak assignment was based on a comparison with library mass spectra (NIST 1.7, WILEY275). The three canvases under investigation appeared to be in a good state of conservation, although several craquelures were identified. These were probably due to the mode of storage. It is possible, in fact, that fewer craquelures would have been found if the canvases had been stored stretched, instead of being rolled up. In looking at the three selected stripes, a remarkable difference in the execution technique was noted. This was due to the different location inside the cave and to the different significance of each canvas. Many unconventional materials were detected in the canvases belonging to the ceiling: wires, sand, and a probable residue of gunpowder used to ‘shoot’ the colour onto the fresh binder. The colours were unevenly distributed on the surface, leaving large areas of the white preparation below to shine through. Instead, no unconventional materials were found in the stripe of the wall and the paint was applied more evenly, resulting in a visibly darker colour cast. The study of the data acquired in situ and on the samples made it possible to identify most of the materials used by the artist. In particular, considering the binder, the FT-IR spectra of the majority of the analysed samples showed, in more or less evident way, the typical absorption bands of a polyvinylacetate resin (PVAc): 2921 and 2852 cm−1 (aliphatic CH stretching), 1735 cm−1 (C = O stretching), 1427 cm−1 (asymmetric CH2 bending), 1375 cm−1 (asymmetric CH3 bending), 1240 cm−1 (CH in plane bending), 1125 cm−1 (C-O stretching) . Py-GC/MS and GC/MS analyses were performed on different samples in order to confirm the chemical composition of the medium used by the artist. 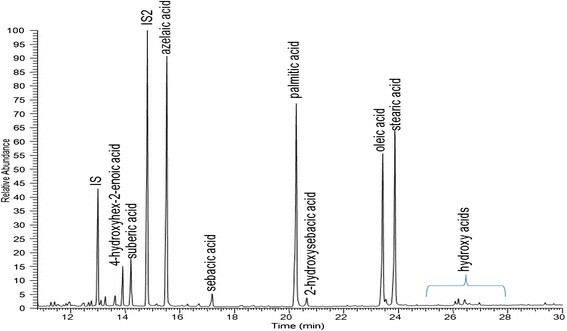 the pyrolitic profiles of samples L3, L5 and L12 showed the presence of several markers of a polyvinylacetate resin, such as benzene, acetic acid and different aromatic derivatives . 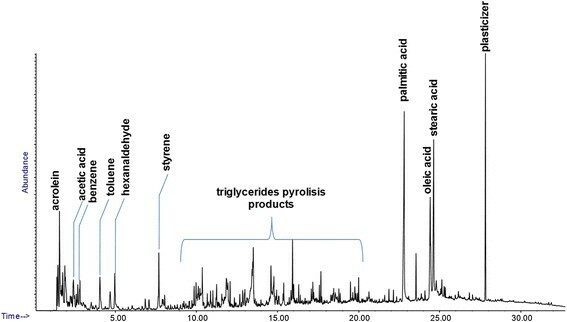 The chromatogram also showed the presence of characteristic markers of a drying oil, with large amount of palmitic, oleic and stearic acids (Figure 2). In order to confirm the presence of a siccative oil, GC/MS analyses after saponification, extraction and derivatisation with a silanising agent, were performed. The results can be seen in Table 1, and the chromatogram of sample L12 is shown in Figure 3. The GC/MS analysis shows the presence of all the main fatty acids characteristic of an aged oil, such as suberic, azelaic and sebacic acids, and also common dicarboxylic acids deriving from the drying process of a siccative oil . 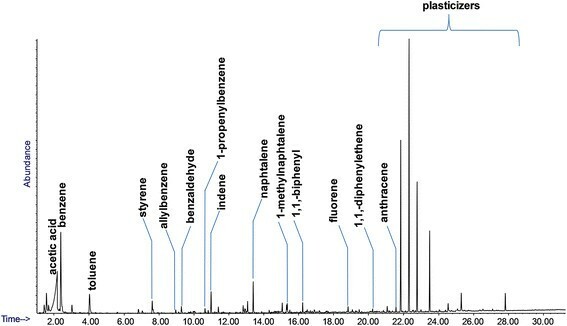 the pyrolitic profiles of samples A2 and A19 (Figure 4) showed only the presence of the characteristic molecular markers of a PVAc resin and large amounts of various plasticisers, characteristic additives used in the production of synthetic polymers; no markers of any oil were identified. as for samples A2 and A19, the pyrolitic profile of sample P8 showed only the presence of markers deriving from the pyrolysis of a PVAc resin. Py-GC/MS chromatogram of sample L12. Legend - P: palmitic acid, S: stearic acid, A: azelaic acid, O: oleic acid; ∑Dic%: total amount of dicarboxylic acids (%). GC/MS chromatogram of sample L12. It was obtained after saponification, extraction and derivatization; IS1: hexadecane, IS2: tridecanoic acid. Py-GC/MS chromatogram of sample A19. It shows the typical markers of PVAc resin. These results are in agreement with the notes made by Gallizio himself, who, in his Diario-Registro, declared that he used Vinavil® and/or traditional siccative oils as binding media ,,. The study of the coloured areas made it possible to affirm that Gallizio did not seem to have any specific preferences in his ‘artistic materials’, since he used both inorganic and organic pigments for the creation of this work. In considering the FT-IR spectra of the white samples, we were able to identify absorption bands of barium sulphate at ca. 1166, 1111, 1067 (SO42− asymmetric stretching), 983 (ν1 SO42− in plane bending), 631 and 604 cm−1 (doublet, ν4 SO42− out of plane bending) . In addition, FORS spectra showed two absorption bands at 670 nm and 728 nm, which are typical of Co2+ ion in pseudo-tetrahedral coordination as a vicariant of Zn2+ in the structure of ZnS. The presence of this ion has been associated with a lithopone pigment (BaSO4 + ZnS) produced after the mid-1920s ,. The presence of ZnS in these samples was confirmed by their FORS spectrum in the 270–800 nm range. The typical strong absorption in the UV region below 350 nm with an inflection point at 340 nm ascribable to ZnS electronic transition was also observed  (Figure 5). FORS spectrum of sample P3 in the 270–800 nm spectral range. It shows the spectral features of the lithopone pigment. 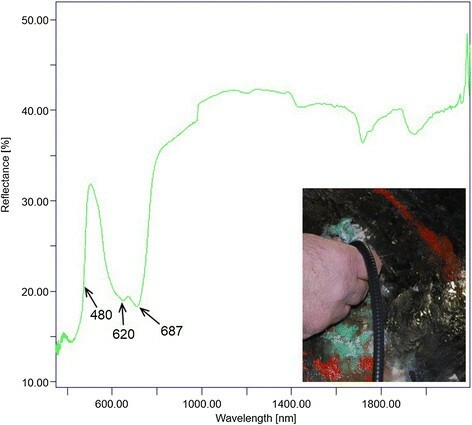 Micro-Raman analysis of white pigments confirmed the outcomes of both FT-IR and FORS. In most cases, a lithopone pigment was indeed identified, while in some samples, only the most intense peak of barium sulphate at 988 cm−1, due to the sulphate stretching mode (ν1), was detected (Figure 6A and B) . Raman spectrum of sample P3 (A) and L2 (B). The former shows the absorption bands of lithopone, the latter only the most intense absorption due to barium sulphate. It was not possible to identify the black pigment by means of FT-IR and FORS analyses. However, Raman spectra revealed the characteristic bands of C-C bonds (Figure 7), which are related to the presence of a carbon-based pigment ,. Raman spectrum of sample L5. It shows the typical features of an amorphous carbon based pigment. Two different pigments were identified on the blue areas. In considering FT-IR spectra of the blue samples detached from the ceiling, we were able to identify absorption bands of ultramarine blue. In particular, overlapping stretching bands of Si-O-Si and Si-O-Al between 1150 cm−1 and 950 cm−1 were present, as well as bands at 700 and 650 cm−1, which were due to Si-O bond vibrations (Figure 8) -. ATR FT-IR spectrum of sample A3 (inner surface). It shows the absorption bands of the ultramarine pigment. Ultramarine blue was also identified in the Raman spectra in Figure 9, where its characteristic peaks (the symmetric stretching vibration (ν1) of S 3− at 548 cm−1 and the first overtone of the stretching vibration (1ν1) at 1096 cm−1) are clearly visible ,. Raman spectrum of sample P4. It shows the spectral features of the ultramarine pigment. Furthermore, the UV–vis-NIR reflectance spectra showed a maximum of reflectance at about 447 nm and one around 770 nm, thus confirming the reddish component in the hue of this blue pigment as reported in the literature . The absorption centred at 600 nm was due to a charge transfer electronic transition that was related to the presence of the S 3− ion in the crystal structure of the aluminosilicate . A phthalocyanine blue pigment was identified on the canvas of the wall. Indeed, as can be seen in Figure 10, the Raman spectrum of sample L13 shows the characteristic peaks of the phthalocyanine blue (PB15), whose Raman signals are very intense in the 1342–1328 cm−1, 1530–1518 cm−1, 681–679 cm−1, and 745–748 cm−1 ranges ,,. Raman spectrum of sample L13. It shows the spectral features of a phthalocyanine blue (PB15) pigment. Red areas were also created by using different pigments. 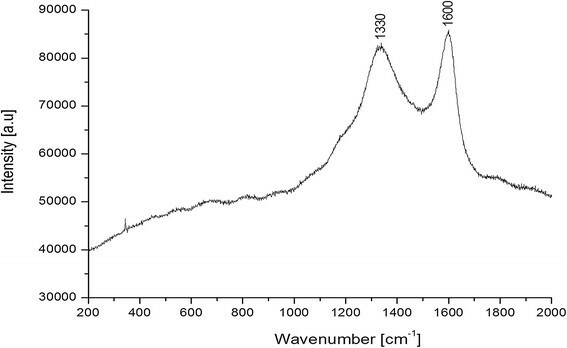 In considering FORS spectra acquired in situ, for example, spectra with the typical spectral features of iron oxides (Figure 11A) as well as spectra with an “S”-shape absorption band and an inflection point at 600 nm (Figure 11B) were acquired. FORS spectra of an ochre red area (A) and of a brilliant red area (B). The former shows the absorption bands of an iron oxides based pigment, the latter an “S”-shape absorption band due to the presence of PR3 pigment. In the latter case, only the Raman analysis of the red sample A14 enabled us to make an unequivocal identification of the pigment responsible for the colour. The Raman absorptions at 1620, 1560, 1499, 1447, 1397, 1334, 1258, 1221, 1187, 1131, 1080, 990, 845, 799, 726, 620, 459, 386 and 344 cm−1 were, in fact, attributable to a PR3 monoazo pigment ,. Gallizio used different pigments also for the yellow colours. The FORS spectra acquired in situ on different yellow areas showed different spectral features. The brilliant yellow of canvas A, for example, had an “S”-shape spectrum with an inflection point at 486 nm and an intense absorption band in the UV–vis region, due to a n(azo) → π* transition of a monoazo PY3 yellow pigment . Also the “S”-shape spectrum of the dark yellow had an intense absorption band in the UV–vis region. In this case, however, the first derivative spectrum showed an intense maximum at 534 nm with a weak shoulder at 486 nm. These spectral features were possibly due to the presence of a mixture of a lead chromate yellow with a monoazo PY3 pigment ,. 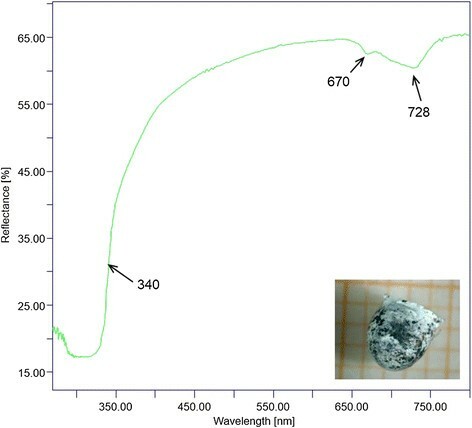 This hypothesis was confirmed by the Raman spectrum of sample L14 in which the bands of lead chromate (355 and 840 cm−1), of calcite (451 and 988 cm−1) and of monoazo PY3 pigment (412, 622, 649, 747, 1035, 1140, 1188, 1275, 1310, 1338, 1387, 1566, 1600, 1615 and 1670 cm−1) were easily detectable. In the case of the yellow ochre, the FORS spectrum showed the absorption of a white pigment (at 364 nm) together with the absorption bands of goethite, α-FeOOH. In fact, charge transfer transition absorption at 480 nm, as well as ligand field transition absorptions at 650 and 920 nm were found ,. In the FT-IR spectrum of sample A8 (Figure 12), the absorption bands at 3121, 898 and 797 cm−1 unequivocally confirmed the presence of goethite in the yellow ochre areas ,. ATR FT-IR spectrum of sample A8 (inner surface). It shows the absorption bands of goethite. Lastly, the green areas were created by mixing a blue pigment with a yellow one. FORS analysis (Figure 13) enabled us to hypothesise the presence of a yellow monoazo pigment (absorption under 480 nm) together with a phthalocyanine blue (absorptions at 620 nm and 697 nm) ,. FORS spectrum of a green area. It shows the spectral features of a mixture of a phthalocyanine blue and a yellow pigment. In considering FT-IR spectra of samples L17 and L18, instead, we could identify only the absorption bands due to the binder and to the BaSO4. Thus, no useful information on the coloured compounds was obtained. The proof that a blue-yellow mixture was used for the green areas was obtained from the Raman analyses. 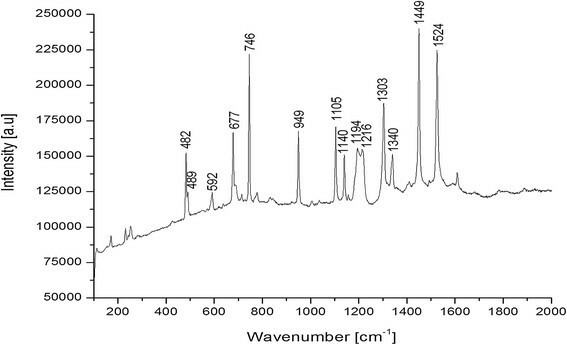 Raman spectra of green samples, in fact, showed both the absorptions of a phthalo blue PB15 pigment at 1530, 1450, 1139, 1106, 745 and 680 cm-1 5 and the peaks due to a monoazo PY3 pigment at 1613, 1543, 1494, 1425, 1385, 1337, 1310, 1189, 795, 395 and 142 cm−1 ,. This research was focused on the application of spectroscopic and cromatographic techniques to the study of some of the materials used in the La caverna dell’Antimateria. Since preservation of the integrity of the object is a priority in the art conservation field, non-invasive and micro-invasive analytical techniques were applied in order to identify the main compounds that constitute this work of art. The integrated use of FORS, FT-IR and Raman spectroscopies was successfully employed to reconstruct the artist’s pictorial palette, while Py-GC/MS and GC/MS made it possible to identify the binding media used by the artist (Table 2). Legend - (F1: FORS (350–2200 nm); F2: FORS (270–800 nm); IR1: FT-IR ATR; IR2: FT-IR transmittance; R: Raman; PY: Py-GC/MS and GC/MS. The results obtained enabled us to affirm that Gallizio in this work used traditional organic pigments, such as ultramarine blue, lithopone, and carbon black, as well as modern organic ones, such as monoazo PY3 yellow pigment, PR3 monoazo red pigment, and phthalocyanine blue PB15. Pigments were applied by the artist using a PVAc binder on the canvases of the ceiling, while siccative oils and PVAc were found on the canvas of the wall. Wires, sand and traces of gunpowder were also observed, thus confirming Gallizio’s use of unconventional artists’ materials. All of the collected results found in this study are now available to the curators of the “Luigi Pecci Center of Contemporary Art”, and can be used to evaluate the conservation-state of the investigated artwork and to identify its risk factors in order to select the most appropriate preservation practices. The authors wish to thank the Regione Toscana (Tuscany, Italy) for financing the Preventive Conservation of Contemporary Art (CoPAC, 2011–2013) Project within the framework of PAR-FAS Regional Project (2007–13). A special acknowledgement to Stefano Pezzato and Raffaele Di Vaia, curators of the “Luigi Pecci Center for Contemporary Art” (Prato, Italy), for having permitted us the access to the work of art. Thanks also to the Archive Gallizio for providing useful information regarding the Gallizio’s artistic technique. GB, CC, VM, SM and MP performed and interpreted the FT-IR and FORS analysis and drafted the paper EG, SL, GL, SP and VP acquired and interpreted the micro-Raman spectra and wrote the paragraphs in the manuscript concerning this technique FDG, JLN, FM and MPC performed and interpreted the Py-GC/MS and the GC/MS analysis and wrote the paragraphs in the manuscript concerning these techniques. All authors read and approved the final manuscript.